Your furnace is essential, not just for the comfort of your home, but also for the health of you and your family. The best thing you can do to take care of your furnace, and avoid common problems or having to replace it too soon, is proper preventative maintenance. You don’t just want to wait until the furnace has a serious malfunction before you give it attention. It could happen during the colder winter months, when you’d need it the most. Maintenance will also help save you money in the long run, including reducing your energy costs. While there are certain tasks that should be left to professionals, such as HVAC company Entek, there are definitely some steps you can take on your own. Here are some furnace maintenance tips that will ensure your unit runs smoothly and stays in good condition for years to come. 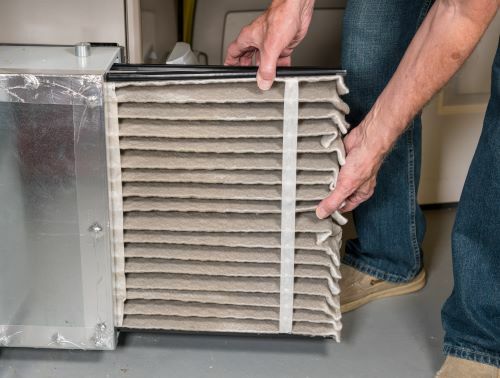 Whether you use disposable paper filters or a reusable, washable filter, this is one of the most important things you can do to keep your furnace working effectively. However, it’s a step that many people overlook. Technicians will sometimes find that a breakdown happened just because someone neglected to change an old filter. Air filters prevent dust, dirt, and other particles from building up and clogging your furnace. When there is buildup, the furnace has to work harder to keep air running through the system. So when the filters are old and dirty, it can increase your heating costs and make the furnace less efficient. Clean filters can also make your home healthier by improving the indoor air quality, which can be even more polluted than the air outside. This is especially helpful for anyone who has allergies. It is usually recommended you clean or change your filters once a month. You should at least check them every month and hold them up to the light to get the best look. This is especially important during the winter months, when your furnace is being used consistently. Filters also need extra attention if your home has pets or generally dusty conditions. If you use washable filters, make sure they are dry before putting them back in the furnace. And if you use disposable filters, make sure you always have extras around. Also, double-check your owner’s manual for any manufacturer recommendations related to filters, just in case. Keep the furnace and its components clean, and the area around the unit clear. Avoid placing any furniture, boxes, or other items too close to it. This also helps the air circulate more freely. Usually, keeping an area of several inches around the unit clear will work. It’s also important for safety. You should especially not put any flammable items like paint or paint thinner near it. And you want to make sure both you and any technicians will be able to access the furnace easily, without obstructions in the way. Regularly check your air registers or vents. You don’t want them to be blocked by anything or have dust and debris trapped inside. If they are blocked, you won’t get proper airflow, and this can cause hazardous leaks. To clean, use a large bristle brush and vacuum hose attachment. Check that the outdoor exhaust pipes aren’t blocked either. Don’t overlook cleaning the blower. This is where dust, dirt, and other particles can go through the filters and collect. Dirt is a major problem for furnaces and will waste fuel and lower efficiency. For safety purposes, always shut off the breaker connected to your furnace before you begin any cleaning or repair work. You can access the blower by removing the panels, which are usually right around the same area as the filter. Usually, you can just clean by wiping it down with a damp cloth. If there’s any dirt that’s extra stubborn, try using a toothbrush. While you’re cleaning, inspect the blower belt. If it looks worn, frayed, or cracked, you should really consider replacing it or contacting a professional to do so. Using a brush attachment, vacuum up any dust and debris inside and around the area. Also, brush off any dirt and grime that’s on the outside of the unit. Do this ahead of the colder months, just to make sure everything’s working as it should. Set the thermostat at a temperature higher than outside and make sure it kicks on. While this usually indicates that it’s fine, you might also want to wait just to make sure it actually goes up to the temperature you set. Also, look for any frayed wires around the thermostat. If you see any, don’t touch them; contact a professional immediately. Have your furnace inspected by professionals once a year. While you can perform these previous furnace maintenance tasks yourself, there are certain things only an expert, certified HVAC technician knows to do and look for. The technician will inspect to make sure the furnace is operating properly, perform some maintenance tasks, such as clean up, and generally ensure it’s at peak efficiency. If they suspect any major problems, they will advise you on the best solution. This annual inspection should be fairly affordable and will prevent larger expenses, such as emergency repairs or having to replace your entire furnace. Make sure to be as safe as possible when performing any of these maintenance tips. Turn off the power source to prevent any potential burns, electric shock, or even fire. Also, check for any leaks. If there is a strong gas smell, for example, get out of the building immediately and call the fire department. Regularly test smoke and carbon monoxide detectors, and replace their batteries at least twice a year. If either detector is not working, it could be life-threatening. And in general, follow the manufacturer recommendations. These furnace maintenance tips should be fairly simple to follow and will help you out quite a bit. But if there are any issues or you have any questions, contact an HVAC professional, such as those at Entek. We’ve been serving the Pacific Northwest area since 1946. You can find out more about the services and technicians at Entek on our website.